I have been hooked on this bright red chocolate cake since I was a wee little girl. I have been watching my mom make this cake during the holidays my entire life. And when she makes it, she makes this special homemade frosting similar to a roux. It’s light, not too sweet, and has coconut flakes in it. I have to get this frosting recipe from her one day and attempt to make it myself…. Just like my mom, I have taken on the tradition of making red velvet cakes in my household during the holidays. For some reason I never got the family red velvet recipe from my mom, and stumbled across this recipe years back. I was sitting on the couch getting over a night shift I had just completed, and saw a rerun episode for Sara’s Secret’s on the Food Network. A man that goes by the name of Cakeman Raven was on the show sharing his Red Velvet Cake Recipe. His recipe didn’t look too complicated for a novice baker like myself, so I decided to give it a spin and see how this car drives.. When I came to after a few hours of sleep and slumber the baking begin. Made It…. Loved it…. Never Looked Back….. This cake was super moist, and I was in love with the fluffy light cream cheese frosting. After making this recipe over and over, I have adjusted some of the ingredients to suit my family’s taste. I decreased the oil to only one cup, which still allows for a moist cake. I also increased the cocoa powder to get more of a chocolate flavor. When it comes to the frosting I decided to cut down on how much of the sugar I used in the cream cheese frosting. I use 3 cups of the shifted 4 cups of powdered sugar for the frosting. This gives me a lightly sweetened frosting that’s not too sweet and allows the cream cheese flavor to permeate through. When I make it for folks, this cake disappears quick. My new catering clients not just ate a sample during our tasting but took to go slices home because they loved it so much. (I even saw them eating the cake while they were walking to their car). It’s that good…. If you are in the Brooklyn area check out Cake Man Bakery and have a slice made by the CakeMan Raven himself. Looking for more cake or dessert recipes? A truly moist red velvet cake with a light fluffy whipped cream cheese icing. Spray three 9 inch cake pans with baking spray. Set aside. In another large bowl use a whisk to mix all of the cake's wet ingredients together. These ingredients include the vegetable oil, buttermilk, eggs, food coloring, vinegar, and vanilla extract. In a standing mixer, combine both the dry and wet ingredients for the cake. Mix the batter just until the mixture is blended. Scrap sides of bowl with flat spatula to incorporate all ingredients into the batter. Pour the batter into each greased baking pan, making sure to put an even amount of the batter into each pan. Place the pans in the oven and bake for 18 to 20 minutes or until a toothpick appears clean after inserted into the cake. At about the 16 minute mark, start checking for doneness. While baking the cakes, rotate the cakes halfway during the cooking process. When the cake layers are done, let them cool completely. Once cooled, frost the cake. Place the butter, cream cheese, sugar, and vanilla in a standing mixer bowl. Mix the ingredients for about 5 minutes on medium speed until the frosting is light and fluffy. While mixing the ingredients, occasionally scrape the sides of the bowl to ensure that all the ingredients get mixed together. After the cakes have cooled frost the cake. I used 3 cups of the shifted 4 cups of powdered sugar. Sweeten according to your liking by adding half a cup of the powdered sugar at a time. The more sugar you add, the thicker the frosting becomes. When the frosting or frosted cake is placed in the refrigerator, the frosting does thicken up, but once set out for about 5 to 10 minutes, the cream cheese frosting softens back up and has that light texture. If you don't like the light texture of the frosting, before frosting the cake, let the frosting sit in the refrigerator until it becomes slightly stiff. This frosting recipe allows for an abundance of frosting to either make a crumb coat, allow for quick fixes if you mess up during the frosting process, thicker layers of frosting, etc. As you can see, I have two sets of pictures in this recipe post. One cake picture has three layers, and the other cake pictures have two layers. When I make the three layer cake, I use 9 inch cake pans and follow the recipe directions I have posted. When I made a two layer cake, I used two 10 inch cake pans, and cooked the cake in a 350 degree preheated oven for about 15 minutes. This recipe has enough cake batter to use either the three 9 inch cake pans, or the two 10 inch cake pans. I can’t tell you how delicious your red velvet cake looks! I’m putting this recipe in my “must try” file. I love how striking a red velvet cake is and this is perfectly festive for this time of the year. Thanks Janette! It does go great with the holidays! Wow, this is one gorgeous looking cake, and YES very moist!! I have to be careful when I eat this cake, it so good I don’t want to stop! Thanks for stopping by! Oh God! I am juts drooling over that slice of red velvet goodness. Looks gorgeous and love the texture of the cake. Thanks a million! Hope you are having a good day! How pretty and festive this is for the holidays- it looks perfectly moist as well! I’ll have to try this!! LOL good to know! 🙂 Take care! Some of the pictures show two layers of cake, and others three layers.. Will I have enough mixture for three 9 inch cake pans? And is the frosting stiff enough to support three layers? When I make the three layer cake, I use 9 inch cake pans and follow the recipe directions I have posted. When I made a two layer cake, I used two 10 inch cake pans, and cooked the cake in a 350 degree preheated oven for about 15 minutes. This recipe has enough cake batter to use either the three 9 inch cake pans, or the two 10 inch cake pans. When following the recipe directions I have shared, I have never had issues with the frosting not supporting the layers. I used 3 cups of the shifted 4 cups of powdered sugar. Sweeten according to your liking by adding half a cup of the powdered sugar at a time. The more sugar you add, the thicker the frosting becomes – Note the frosting is sweeter when adding more sugar. Oh my goodness, this cake looks heavenly!! Oh my you should try it! It’s delicious! Thanks for stopping by! Sorry for the late response. I have not ever omitted the vinegar in the recipe, as it is suggested that the vinegar helps with the leavening process producing a fluffy cake. Hope it worked out for you. Can I steam this instead of baking? I heard it would make the cake more moist and I don’t have an oven. I’m sorry, I have never steamed the cake before… I would not be able to give you my honest opinion on how this would work. If you do try to steam the cake, please come back and let me know how they went. Happy cooking! Do you think that this recipe would produce at least 25 cupcakes? I’m sorry – I’m not sure about how many cupcakes this recipe can make, because I have not made cupcakes with this recipe. I have only made a 2 layer and 3 layer cake with this recipe. If you make cupcakes with this recipe, swing by and let us know how many cupcakes this recipe can make. Thanks for stopping by! I’m making a 10″ cake with this recipe, and I’ve baked a lot of cakes, I’m assuming the 10″ cakes are verrrrrry thin. I’m definitely going to have to make a double batch for a 10″ cake. Just throwing that out there. When I have made the cakes they thinner of course, but not verrrrry thin. Hope your cake turned out great! Have a good one! Can cream cheese be substituted with butter only? If you use only butter in your frosting recipe, this will now be a buttercream frosting recipe that may be more heavy and possibly sweeter. 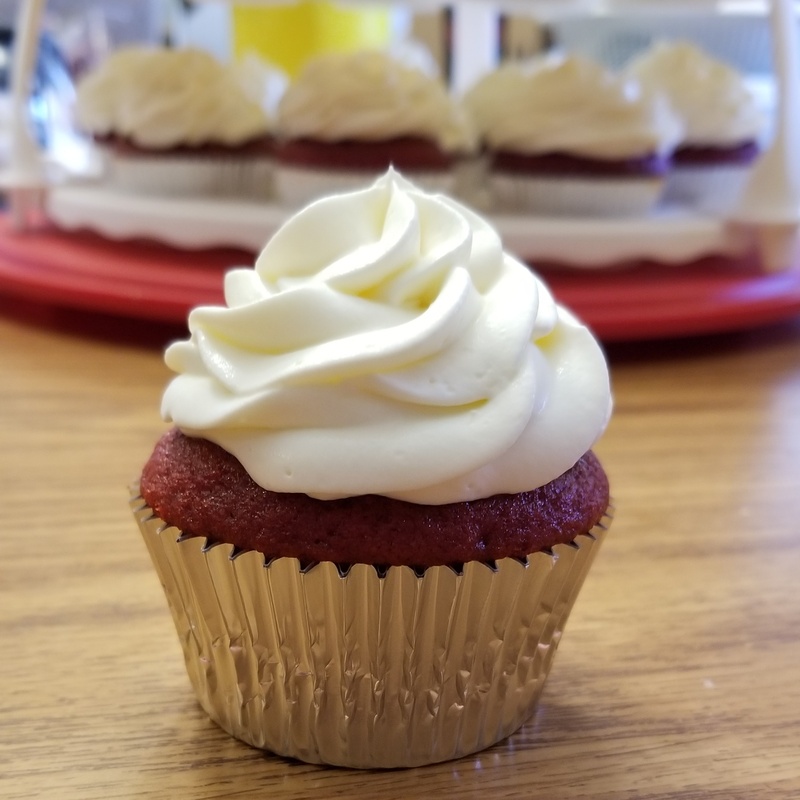 I would recommend looking up a buttercream frosting recipe, if you want to substitute butter for the cream cheese, to ensure success with your butter only frosting. Hope that helps. Thanks my daughter is not a fan of cheese. Do you have buttercream frosting recipe that I can use. No I’m sorry. I don’t have a particular recipe I recommend at this time. but a question, can I use natural coca powder instead of dutch processed coca? or should I add baking powder? Sorry for the delayed response! I have used natural cocoa in this cake but prefere dutch pressed as it gives the cake more depth. Amazing recipe! I used this recipe for cupcakes and it made exactly 24. Thank you for sharing! I am so excited that you loved the recipe! I used this recipe before I got married and loved it. When I was cake tasting for my wedding, I thought that most of them were not as good as this recipe. I’ve never really loved any of the red velvet cakes I’ve tried but this was what my daughter wanted for her birthday. WOW!!! This was amazing & I’m now a fan. These look incredible!! So happy you enjoyed them!! Hello. I am not sure….. Hi..Thanks for sharing the recipe..the cake looks fantastic…Can I use cake flour instead of plain flour ? If yes, should I use the same amount as plain flour ? Thanks for stopping by! I am so sorry but I am not able to give you an answer to that question. I have never tried this recipe with cake flour, so I can’t give you the results of how it would turn out… Happy cooking! Hello! No problem at all! Thanks for stopping by! This frosting can be in the fridge for a few days. I have frozen the cake layers for a few days but no longer than that, so I would not be able to give you a time longer than that.. Have a great one! Dutch cocoa has a rich flavor when compared to other cocoas. Pecans have been used added to the frosted cake before when I have seen nuts added. How did the cake turn out if you added chocolate icing?? Stay blessed! So glad to hear! Happy cooking! Thanks for sharing your tips!